This is the thirteenth in a series of blog posts discussing major figures in film and literature, based on the Major Arcana of the Tarot. I'll be using the 21 Major Arcana of the standard Rider-Waite-Smith Tarot deck. For some more background on the deck's history and its elusive role in popular culture, see this post from HiLowBrow, which is a good primer on the Tarot, and pretty fascinating in its own right. For me, personally, the Hanged Man was one of the more confusing of the Major Arcana (and, thus, one of the more interesting). There's already a Death card, a Devil card, a Justice card, and a Judgement card... what can the Hanged Man archetype bring to this whole network of similar symbols? 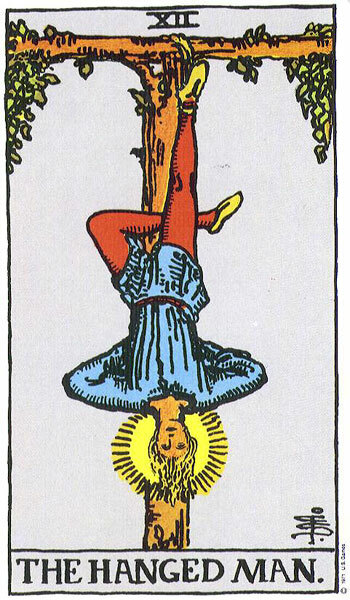 The card itself is sinister, but also oddly peaceful: the Hanged Man has a halo around his head, and he seems placid in his suspension. If you go by Ye Olde Christian interpretation, this is a particular sort of Death that will inevitably lead to New Life (although that symbolism is supposedly implied in the Death card itself, as well). As it turns out, it's really the suspension itself, the prone physical condition of being "hanged" above the Earth, that's the decisive turn in this symbol. Death isn't such a big issue... I mean, look at the card. Is this character even dying? Or is this just some sort of performance art and/or public humiliation? The card is really about the yawning gap between decisive moments, the blank abyss of contemplation, often in lieu of having any immediate control of the situation. This allows the subject to change as fortune changes, taking on a new trajectory... but at the moment the card is in play, there is a moment of absolute stillness and surrender and clarity, the pause between leaping from the cliff and hitting the water. 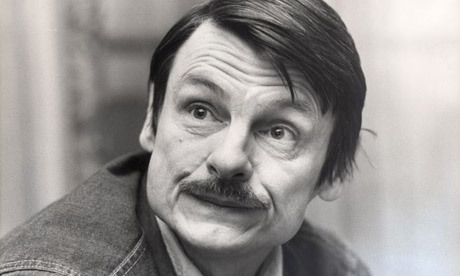 Who represents this suspension better than Andrei Tarkovsky, celebrated Russian film director of avant garde triumphs like Stalker, The Sacrifice, and the original Solaris? If you've gone into Solaris unprepared, you may have felt, in fact, like you were hung upside down over an abyss for an arduously long period of time, and then finally denied any closure that might have made it rewarding. You don't go straight from Guy Ritchie to Tarkovsky. But the long, contemplative sequences in Solaris, and some of Tarkovsky's other films, are absolutely part of his vision and his rhythm... it's part of the suspension, the absolute inaction and uncertainty, that you're supposed to feel, trapped in a sort of emotional nexus on a planet that recreates your suppressed desires. Part of the eventual character development in Solaris calls for reversal of purpose, as the main character, Dr. Kelvin, renounces his assigned mission and accepts a new directive, dictated by the planet itself. This, the Hanged Man's prerogative, is echoed in Tarkovsky's other films, as well... in Stalker, the journey to find a wish-granting room, deep in a dangerous quarantine zone, leads to a radical new understanding of that very power they've been seeking. In The Sacrifice, Tarkovsky's final film, a man facing the end of the world has to reframe the universe to the point where he makes himself the ultimate agent in deciding the world's destiny. In every Tarkovsky film, there is a pause -- usually taking up practically the whole film -- that leads to a primal inversion of the dramatic situation. He carves the cross, and lets his audience fall from its branches; as we lose control, we discover a new purpose that unites the whole cosmic arrangement.